We are proud to say that all MBM training courses are now CPD accredited – The independent accreditation centre. Please see the bottom of this page for our certificates. This means that for Learners and our clients, that an industry leading body has independently assessed our training structure materials, and tutors, and given them all accreditation. Learners that are accruing CPD Points/Credits/Merits can now earn them on our training courses. An external third party verification service provides a CPD assessment, feedback, and ongoing guidance to ensure training providers sell a quality CPD product. The Office is overseen by an expert advisory board that reviews the quality of assessment criteria, methodology and processes to ensure the accreditation remains authoritative. The CPD Standards accreditation is recognised by 1,600 professional bodies that require members to complete CPD which represents 15% of the UK’s workforce (5million people). The standard is recognised internationally and we have providers based across 22 countries including the USA and UAE. The historic value of CPD can be traced back to the formations of guilds in the middle ages to the present day when there is a high demand for regulated CPD. People will continue to develop their skills and acquire the best training available to them. The CPD Standards accreditation recognises market leaders such as Google, Shirlaws, Rosetta Stone, Pitman Training, and Reed Learning. The CPD Research project carried out with Kingston Business School resulted in the need for a higher standard in the provision of CPD and led to the founding of the CPD Standards Office. 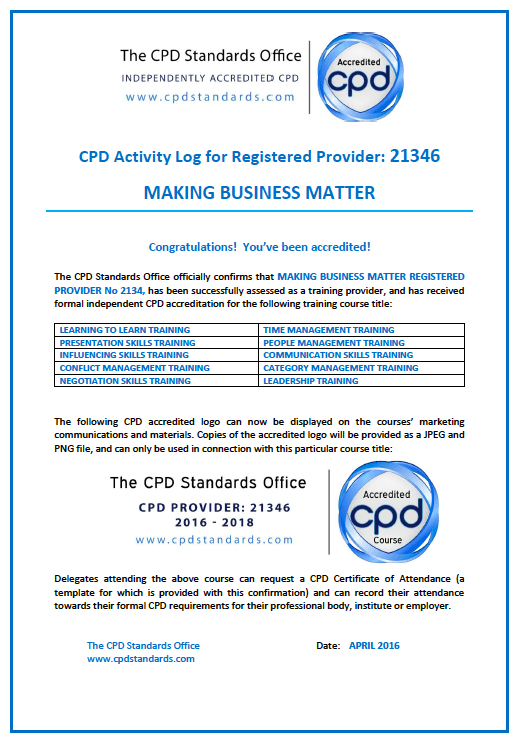 The CPD Standard logo differentiates your marketing as it shows a quality stamp of approval on all your marketing processes. 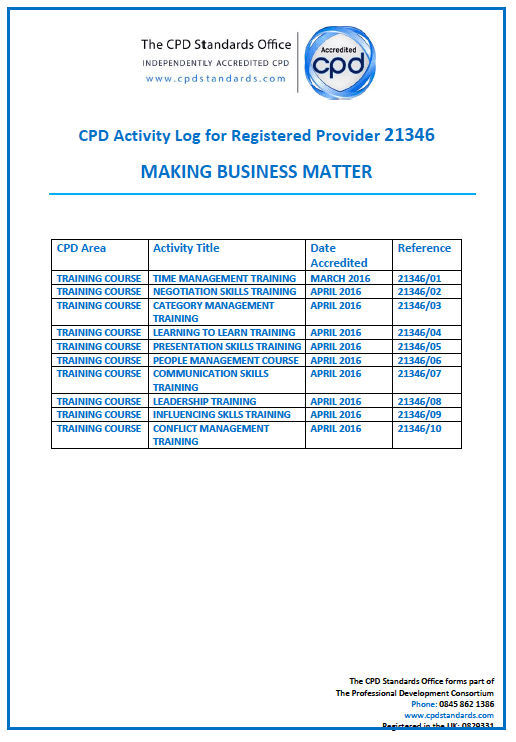 Providers issue formal CPD Standards certificates which improves the appeal of their training or learning activity especially useful within regulated sectors and adds credibility to their reputation. The Office is constantly lobbying and working with government and regulatory bodies to increase the awareness of the importance of lifelong learning and continuing professional development. Established in 1996, the CPD Certification Service supports the Continuing Professional Development policies of institutional and professional organisations on an increasingly global basis. CPD submissions are assessed and accredited against the universally accepted structured checklist which The CPD Service has developed over the past 20+ years. The process takes an impartial and objective overview of structure and value to ensure full conformity to CPD guidelines.